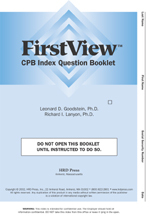 FirstView CPBI is administered via paper/pencil. Administration is quick, easy and provides the hiring manager with reliable and valid information to assist them in selecting the most appropriate candidates. Every single day employees don’t show for work, steal cash and inventory, surf the web and e-mail on company time, and disrupt the workplace. It’s burning up billions of dollars of profits and inventory each and every year. Fact #1: Unscheduled absenteeism may be costing you as much as $755 per employee. Fact #2: 7% of employees believe that it’s okay to sabotage their employer’s computer system. Fact #3: 6% of job candidates have had a criminal conviction in the last 7 years. Fact #4: 46% of inventory shrinkage is a result of employee theft. Fact #5: 40% of workers admit to making personal use of company e-mail and shopping online at work.